If you are looking for Blue Star Aristo RO + UV water purifier review then I must say you are at the right place. In this article I am going to show you all the details about this water purifier which will help you figure out if this water purifier is ideal for you or not. I have also listed pros and cons of this water purifier for your convenience. 1.2 If you are looking for a stylish and compact water purifier with easy handling and RO + UV water purification technologies then Blue Star Aristo RO + UV water purifier is ideal for you. If you are looking for a stylish and compact water purifier with easy handling and RO + UV water purification technologies then Blue Star Aristo RO + UV water purifier is ideal for you. Basically RO water purification is necessary if you are using high TDS water for drinking. Usually water from borewell is high TDS water. Also UV water purification is necessary to remove all the bacterial impurities and harmful viruses from the water. So whether you are using water from borewell or from municipal water supply UV water purification is necessary because the microbial impurities can easily come in contact with water. As mentioned above this water purifier has a very stylish and trendy looks. There is a Blue Star branding at the front on upper side and chrome below it which really looks nice. It comes with “Purification on” indicator and full tank indicator and low pressure alert indicator. The purification on indicator will notify you whenever the water purification process in this water purifier starts. The full tank indicator will notify you whenever the water storage tank of this water purifier will get fully filled. RO water purifiers require pressure of water to carry out water purification process properly. Bluestar Aristo comes with low pressure indicator which will notify you whenever the water pressure is low so you can make some arrangements to fix the problem. So now you may be thinking how much water pressure does this water purifier require. This water purifier will work properly on the normal water pressure of overhead tank. Besides indicators, this water purifier also comes with child lock functionality to the tap. This functionality basically helps to avoid water wastage by locking the tap completely. So you can use this functionality to lock the tap when you are not going to use the water purifier for a long period of time. Also there is a chrome on the tap which looks nice. This water purifier also comes with two colour options black and white. So you can choose the colour as per your kitchen interior. Check out this water purifier in white colour here. Check out this water purifier in black colour here. Bluestar Aristo comes with RO and UV water purification technologies. It also has some other filters as well along with a RO membrane and UV bulb. So it has a pretty solid water purification system. This water purifier comes with with 6 stage water purification. Now let’s have a closer look at each water purification stage its filter and what it really does. The first stage of water purification is consist of pre sediment filter, which removes the sediments from the water. The second stage of purification is consist of pre carbon filter. It removes bad taste and odour causing contaminants from the water. The third stage of purification is consist of sediment filter. As the name suggests this stage of purification removes the sediments from the water. Sediments are basically loose sand or clay particles. 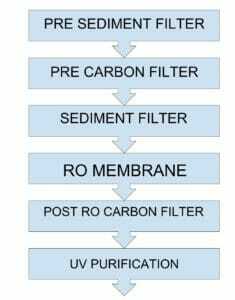 The Fourth stage of purification is consist of RO membrane. The RO membrane is consist of very minute pores. Water is passed with a great fall through this RO membrane which allows water only to pass through it and blocks all the dissolved salts and solids from the water. The RO membrane of this water purifier has the ability to remove TDS upto 96%. The fifth stage of purification is consist of post carbon filter. This water purifier comes with copper impregnated activated carbon which not only removes bad taste and odour from the water but also has antibacterial properties. The sixth and the final stage of purification is consist of UV bulb. At this stage of purification the water is exposed to the UV rays of the UV bulb which inactivates harmful bacteria and viruses from the water making 100% microbe free. The water storage tank is hidden so you can’t see the water level in the water tank. But this water purifier comes with full tank indicator which helps to know if the water storage tank is full or not. It takes anywhere between half hour to 2 hours to fill the water storage tank fully depending on the water pressure and the quality of water i.e. if the water has high TDS then it may take longer to purify it. Sometimes it also depend upon the life of the RO membrane if the RO membrane is new then the purification will be fast and vice versa. This water purifier comes with some helpful indicators. Purification on indicator– As the name suggest this indicator will notify you whenever the water purification process is going on in the water purifier. Full tank indicator– This indicator will notify you whenever the water storage tank will get fully filled. Low pressure indicator– This is a RO water purifier and it requires a decent amount of water pressure for its proper working. The low pressure indicator will notify you if the water purifier is getting low pressure of water. This water purifier does not comes with cartridge life indicator or maintenance indicator which is the good to have feature in a water purifier. This water purifier comes with aqua test booster which uses calcit media to increase the pH of the water which basically helps to enhance the taste of the water. This water purifier comes with a Child lock feature which basically locks the tap which helps to avoid water wastage. Over all users are pretty happy with the design and look of this water purifier. They are also happy with the purification of this water purifier. This water purifier comes with 1 year warranty. If you are looking for a compact water purifier with stylish looks then Blue Star Aristo water purifier is ideal for you. The build quality of this water purifier is also very good and it also comes with chrome which looks really nice. This water purifier comes with 6 stage water purification so it has a very solid water purification solution as well. It also has decent alert system and some additional helpful features such as child lock for the tap. This water purifier does not comes with filter change indicator which is quite inconvenient. Though water pressure of normal overhead tank would be enough for its proper working. You can check customer reviews at Amazon by clicking here. Q. Which water purification technology does bluestar aristo have? 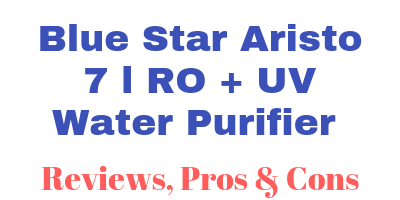 In this article I have reviewed Blue Star Aristo RO + UV water purifier. Q. Does Blue Star Sristo only comes with one colour option. Checkout bluestar aristo black version here. Check out blue Star aristo white version here. A. How many total filters are there in this water purifier? A. No. This water purifier does not cool or warm the water it only purifies it. A. Yes. Pre filter is included in the package of this water purifier. Q. Does this water purifier can purify borewell water or water from municipal water supply? A. As it is RO water purifier so it can remove the excess TDS from the bore well water. This water purifier also comes with aqua test booster which basically helps to retain the essential natural minerals which may get removed during RO purification while purifying water from municipal water supply. Overall it can purifier both water from borewell water and water from municipal water supply. Q. What is the cartridge life of this water purifier? A. The cartridge life of the water purifier is highly depends upon the quality of the water is purifies. For example if it have to purify water of high TDS say 1000 PPM then the cartridge life will be less than if it purifies low TDS water say 500 PPM. Q. After how much time do we will have to change the cartridge of this water purifier? A. It is highly depends upon the quality of the water and the amount of water is purifies. Usually you will have to change the cartridge annually. Q. Does this water purifier comes with TDS controller? A. No, this water purifier does not comes with TDS controller. Instead it has aqua test booster. In TDS controller you have to manually adjust the TDS of the water and it basically helps to retain the essential minerals in the water. The aqua test booster basically uses calcite media which maintains the ideal pH of water and it also enhances the taste of the water by retaining essential minerals in the water.